The Gentleman Crafter: Happy Thanksgiving Day!! Good Morning Everybody and Happy Thanksgiving! an expression of thanks, especially to God. a public celebration in acknowledgment of divine favor orkindness. ( initial capital letter ) Thanksgiving Day. Today, I give thanks for so many things! For my family. What a wonderful thing to have such an amazing and loving family! I am so grateful and blessed! Thank You! For the manners, ethics and the introduction of faith that my Mother and Father taught me! Thank You! To the service men and women who protect our country. Thank You! For the talents God gave me. Thank You! For my awesome job and the ability to work with such incredible people! Thank You! For my pets who give me such comfort and joy! Thank You! For all my wonderful friends who are always there! Thank You! For my online Family...Their support and encouragement..amazing! Thank You! These are just a few...Today I give thanks to God for all these amazing gifts! I'm looking forward to Mom arriving this morning to celebrate the day! She has agreed to spend some time in the studio with me this afternoon! God help us! LOL! Just kidding! It's going to be fun! Sorry about the delay in getting part three up on the turkey. It's added to the previous post! I know my European friends don't celebrate Thanksgiving, but please take a minute and think about all the things you are grateful for and give thanks! I hope you have an awesome Thanksgiving! Happy Thanksgiving Jim. I am thankful for so many things and among them, you. Thank you for sharing your talents. Happy Thanksgiving to you also. I love this turkey, thank you for sharing your talent. Can't wait to see what you and your Mom create. Dear Jim, What an amazing turkey! I love it! It's true that we don't celebrate Thanksgiving but the Holiday Season makes us all think about everything we went through in the passing year ; The good, the bad and the ugly. Which makes us all realize there are many, many things to be greatfull for. One of those things is the start of my crafting blog and the discovery of the online crafting community. Happy Thanksgiving to those who celebrate and a Wonderfull Holiday season to all! Happy Thanksgiving sweetie! A blessed day for you and your family. It's just another dreary, dark and rainy Thursday here in the UK, but I wish you and yours a lovely Thanksgiving day together! Say Hello to Mom for me! Happy Thanksgiving to you & yours, Jim!!! I cannot wait to see the video of you & your Mom. I LOVED the last one. Indeed, we do not celebrate Thanksgiving in France unfortunately, but as you so aptly suggested, we should take for example this will be one day a year, to focus on the important things, and thank everyone who deserves it! and thank you for all the wonderful things you show us every day! Jim, I had such a good time making the turkey today. I couldn't find the pattern for the head and feet so I just free handed it. Close enough. My sister and her husband have all kinds of birds (chickens and ducks) and a horse and a donkey and four dogs and two cats. I know they will love their turkey and the place cards when I get there shortly with the pies. I kept bouncing between your last video this morning and the Macy's parade. Had to say hi to Santa! thanks for all you share with us. Happy Thanksgiving. "What we do for ourselves dies with us. What we do for others and the world remains and is immortal". Thanksgiving isn't celebrated in Australia either, but the list of things to give thanks for would be endless. Happy Thanksgiving, Jim. Oh, how wonderful to be alive! I am thankful for so very much. 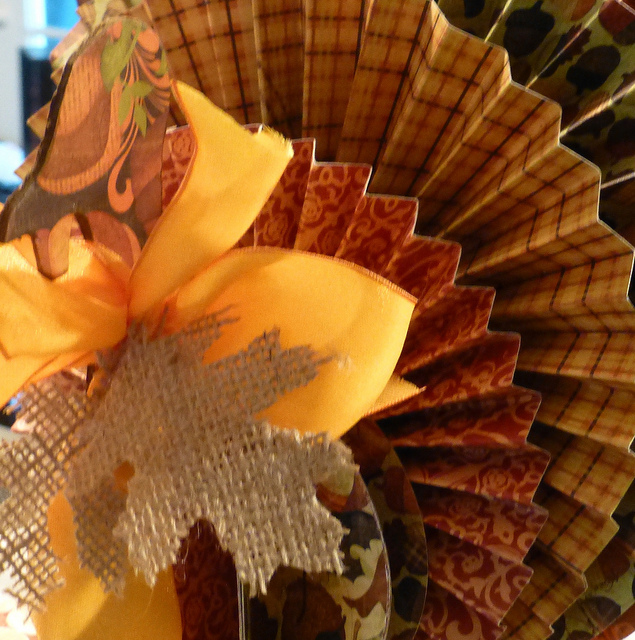 Amongst those many things, I'm thankful for the joy papercrafting gives me. Your blog and those of others make it all that much more fun.Your generous sharing is wonderful. A Very Happy Thanksgiving, Jim! I hope you had an awesome day with family. Hope you and mom got into the studio. I am blessed to have you as a friend. It's been an beautiful relaxing day. Now off to shop! Happy Thanksgiving Jim! I love your blog and I'm always inspired by you. Your post today was just lovely, as is your turkey! It's too late this year to try and make one, but I will attempt this next year most definitely (although I suspect my end result will be sorry next to yours!). Well said Jim! Happy Thanksgiving to you and your family. I am thankful for you and your generosity in sharing your talents. So grateful for our online community who share the passion for crafting. Looking forward to seeing Mom again in the studio. Happy thanksgiving everyone! Happy Thanksgiving to you and your Mom! I too am thankful to have fellow crafters like you to show me how it's really done. Thanks for taking the time to film, I love watching and can't wait to see you and Mom craft again. Happy Thanksgiving Day! We don't celebrate this day in Ukraine, but I wish we could have something like this holiday! And today I thank for many thing as well. And among these things I thank for the possibility to meet such creative people like you. Thank you for inspiration! Happy thanksgiving!!! In Sweden we're just happy it's finally Friday:) Seriously though, thank you for sharing your creativity and inspiration! Wow..love your turkey centerpiece. Truly remarkable. Hope you had a blast with your mom and that you did find time to create together. She was so sweet and fun to watch in your video last time. The love you have for each other was so apparent. Happy Holiday season! Looks like you had a wonderful day, Jim, and for that I am glad. We did not celebrate yesterday with a meal together, as all were working in different directions. But one day soon we will have our turkey. We English (living in the US) have picked up the day as a day of thankfulness, even if we do not celebrate the same origin. Thank you Jim for all you present to us. 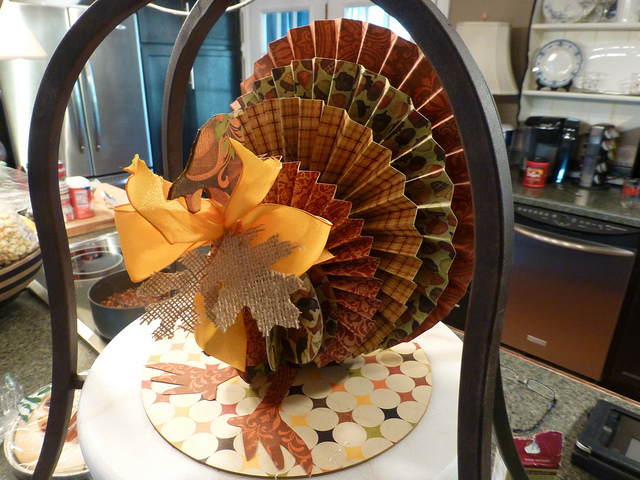 Wonderful turkey , awesome papers/colors, and the burlap leaves, so very creative !! Looks like your day was great... I'm Thankful for You ! And I, for one, am grateful for you and your wonderful posts! HA...I should have taken notes of what I wanted to say. So much you covered in the 3 videos. So, HAPPY THANKSGIVING a day late and Thank You for posting all your creative videos and blogging. First, I would love to see your "Fairies". I have a small collection I started 15-20 yrs ago. When you said Over The Top...I knew I had to see them. I haven't brought them out in a while. I also have angels and ballerinas. Second, I would love to see pictures of your trees this year. I did see your house last year, so if you are downsizing, I want to see. I cut back on my decorating about 6 yrs ago. No one here to help me now. It was just too much for me to do alone now. But with grandkids around, I really should. I think I need to simplify the way they are packed away so I can get to it easier. Jim, It was lovely to hear about your Thanksgiving spent with your family and I bet your Mum loved spending the day with you.Your 'turkeys' are delightful and I'm sure your table was set to perfection. We don't,of course, celebrate Thanksgiving over her in Australia but I think it's a great tradition.Christmas here is our big celebration where we give thanks for family and friends as well as celebrate the birth of Christ. Not long to wait until that wonderful day when I will start the day off watching my five grandchildren [all belong to my eldest daughter] opening Santa's gifts.Their Mother Donna,was born on Christmas Eve - wasn't I clever? Every happiness and may creativity flow freely in the coming new year.